Nothing truly counts as a moral panic until Senate Minority Leader Chuck Schumer, D-N.Y., appoints himself the head of it. Sure enough, Schumer is the latest public figure to add his voice to the increasingly hysterical campaign being waged against the nation’s largest e-cigarette company, Juul Labs. Schumer is demanding an immediate ban on so-called “kid-friendly” e-cigarette flavors, singling out Juul for contributing to an “epidemic” of high school vaping. What constitutes a “kid-friendly” flavor is unclear, but apparently creme brulee fits the bill. 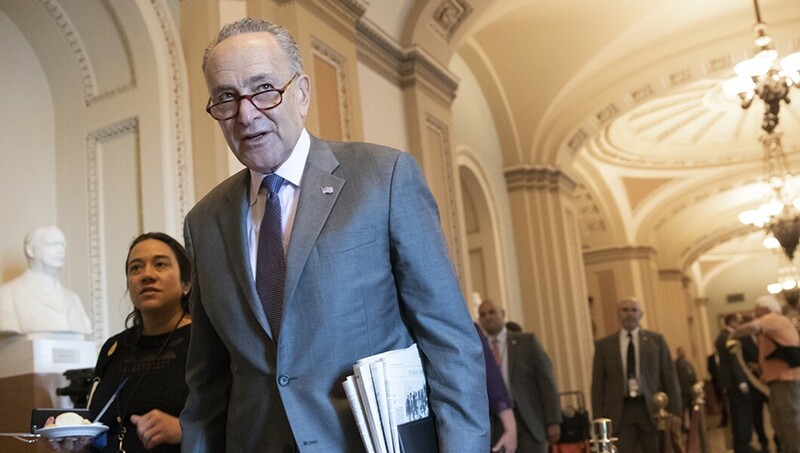 Schumer’s vehement attack on Juul is puzzling given that just a few weeks ago with much fanfare, he pledged to introduce legislation that would decriminalize marijuana nationwide. After decades as a happy drug warrior, Schumer’s sudden conversion begs an obvious question: Why decriminalize smoking marijuana but ban flavored e-cigarettes, which are a safer alternative to cigarettes and help adults quit smoking? Ostensibly the answer is that e-cigarettes like Juul are making their way into the hands of minors. Given that more teens use marijuana than e-cigarettes, despite marijuana being illegal at the federal level, it’s hard to square abandoning marijuana prohibition, on the one hand, with banning a large category of the most popular tool for quitting smoking. The more likely explanation for this seemingly contradictory position lies in the fact that there are electoral dividends to be reaped in supporting marijuana reform, and there are bonus points to be won by seizing on the moral panic developing in the wake of a blitzkrieg of negative media coverage surrounding Juul. Hundreds of articles have been published in the past few weeks citing anecdotal evidence of mass “Juuling” in high-schools, hopelessly addicted teens, and unsubstantiated claims of a “gateway” to smoking. True to form, Schumer has decided this is a bandwagon he and others should jump on. The creation of two Stanford University engineers, Juul vaporizes a liquid containing nicotine salts and effectively mimics the feel of a regular cigarette. This makes Juul an attractive proposition for smokers looking to switch but also makes it a target for advocacy groups such as the Campaign for Tobacco-Free Kids who are hostile to vaping as a viable strategy for tobacco harm reduction and view e-cigarettes as a potential gateway to smoking and a boon to the tobacco industry. Now it just so happens this flurry of bad press for Juul began shortly after anti-e-cigarette groups, including Campaign for Tobacco-Free Kids, filed a lawsuit against the FDA to bring forward expensive product application deadlines for e-cigarette manufacturers. These pre-market applications are set to bankrupt most e-cigarette companies, dramatically limiting options for smokers who want to switch to vaping. The Campaign for Tobacco-Free Kids have been quick to assure us this is a mere coincidence and not the result of an orchestrated public relations campaign. Regardless of the truth of these claims, the coverage of Juul almost exclusively focuses on anecdotal evidence from a small number of high schools. So what is the actual data on Juul use and e-cigarettes more broadly? Juul’s rise in the e-cigarette market is pronounced, enjoying year-over-year sales growth of nearly 800 percent in 2017, helping to drive a 40 percent growth in the overall e-cigarette market. Analysts believe Juul’s growth also helps explain an unexpected 6 percent decline in U.S. cigarette volumes in the first quarter of 2018. Far from abetting the tobacco industry, Juul appears to be disrupting it, joining an increasingly competitive innovation race to create safer and more satisfying alternatives to cigarettes. As for youth use, there is little actual data. But according to the Truth Initiative, just 7 percent of 15-17 year-olds have even tried a Juul. It’s true that overall youth experimentation with e-cigarettes surged from 2011-15, but in 2016 youth vaping declined. Over the same time period, teen smoking dropped to a record low of 8 percent. In fact, the rate of decline in teen smoking since 2010 is four times greater than it was between 1975 and 2010. Crucially, the adult smoking rate is also declining at an accelerated pace, driven in large part by the rise of vaping. Instead of vaping acting as a gateway to smoking, we are seeing the exact reverse. “If smoking marijuana doesn’t hurt anybody else, why shouldn’t we allow people to do it and not make it criminal?” Schumer told Vice News in April. Reforming America’s outdated and unjust marijuana laws is admirable, but waiting to do so until there is an electoral prize to be won is cowardly.